COLUMBIA, 3/20/12 (Op Ed) -- It was a bizarre twist when, in 2000, Boone County Assessor Tom Schauwecker argued that agricultural land was prime development land, and the land's owner, State Farm Insurance, should therefore pay higher property taxes. For virtually every big developer in town, Mr. Schauwecker argues exactly the opposite: That prime development land is agricultural land, and owners like Stan Kroenke should pay lower property taxes. Groups like Regional Economic Development, Inc. (REDI) wonder why Columbia lacks big employers. We need jobs, REDI says, and their Blight Decree and Enhanced Enterprise Zone (EEZ) require big property tax breaks to bring new employers to town. But given Boone County's recent history, REDI's push seems absurd. With not one, but two cases against State Farm Insurance, Mr. Schauwecker -- who recently filed for his 24th year in office -- and the Boone County Commission, which is part of REDI -- sought millions of dollars in additional property tax value. As with similar cases against 3M, Square D, and Columbia Regional Hospital, REDI -- "founded in 1988 to promote positive economic expansion in Columbia and Boone County" -- was nowhere to be found. And yet according to REDI, State Farm is Columbia's 9th largest employer, with over 1,060 employees. In the first battle with the local employment giant, Mr. Schauwecker asserted that a 107-acre plot of vacant State Farm real estate near its headquarters at 4302 S. Providence Road was worth $5,840,000. The Boone County Board of Equalization -- staffed by Boone County Commissioners including Karen Miller -- agreed. State Farm appealed, and a State Tax Commission hearing officer instead found a value of $911,000 -- nearly $5 million less -- in June 2000. Mr. Schauwecker appealed to the full 3-member Tax Commission, claiming that the "hearing officer erred when he determined that the highest and best use of the 107.25 acres of undeveloped land...was for agricultural purposes. The subject property is prime development land," Mr. Schauwecker asserted. "Infrastructure exists for commercial development; the property is located within the city limits of Columbia; and the property is zoned C-O-1." Just like the 133 acres Stan Kroenke owns across from Mill Creek Elementary, but for which he pays only about $260/year in property taxes. 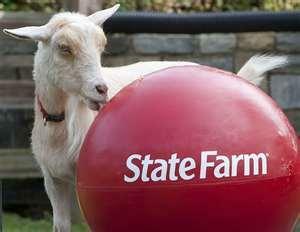 The State Tax Commission sided with State Farm. For his appraisal, Mr. Schauwecker, they wrote, "utilized sales of lands which are lacking in the most critical factor for comparison" -- similar size. FAIRGROUNDS FAIL: Nineteen years and many plans later, another Boone bailout? FAIRGROUNDS FRACAS: County Commissioner blasts critics of Columbia sports center "theft"
WHY IS ROGER B. WILSON'S NAME: Still on the Boone County government building? BOONE HOSPITAL IN DECLINE? Trustee candidate talks options, worries about "deteriorating situation"